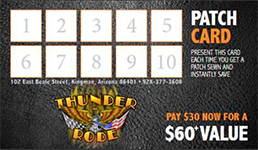 Thunder-Rode sews patches on anything! From leathers to guitar cases to uniforms, we can sew patches anywhere you like on your apparel. 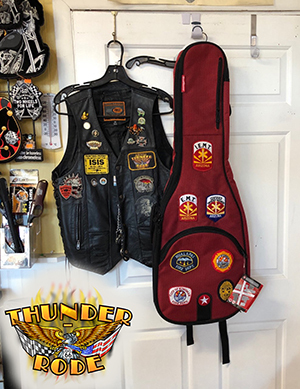 You have the option to have a patch custom made by us, bring in your own personal patch/patches, or purchase a patch in our motorcycle shop. We are experienced and will do an excellent job customizing your apparel. We will never sew your patches shut! Our Singer 29K long-arm patcher enables us to sew all the way up to the shoulder and inside sleeves and pockets so you don't end up with unusable pockets. Your patch can be sewn anywhere you'd like. We sew patches on leathers for clubs from Phoenix, AZ to Las Vegas, NV. Whether you need a club patch sewn on a leather vest or leather jacket, we can get the job done. We can also sew patches on uniforms, such as work shirts, Gis, coats, military apparel, etc. If you belong to a club or organization that requires patches sewn on apparel frequently, then get our Patch Card. Our Patch Card will enable you to save on patch sewing. Our Patch Card is great for clubs and organizations with ongoing multiple patch jobs. For just $30, you will receive 10 patches sewn. Any Patch! The average cost of a sewn patch is $6, with some patches going as high as $15 (depends on size of patch). That is a HUGE Savings!! Ask about our Patch Card today. Need a patch custom made? No problem! Bring us the image of what you want custom made into an embroidered patch. We can digitize your image and prep it for our embroidery machine. The result is an exact replica of your image converted into a custom made embroidered patch. Stop in with your design any time.